Research Document #12, page 6. Click on each small image to open a full-sized image in a separate window. The image on the left is the scanned original, cropped and straightened; the image on the right is a facsimile. The center is a transcription of the relevant text. 51. 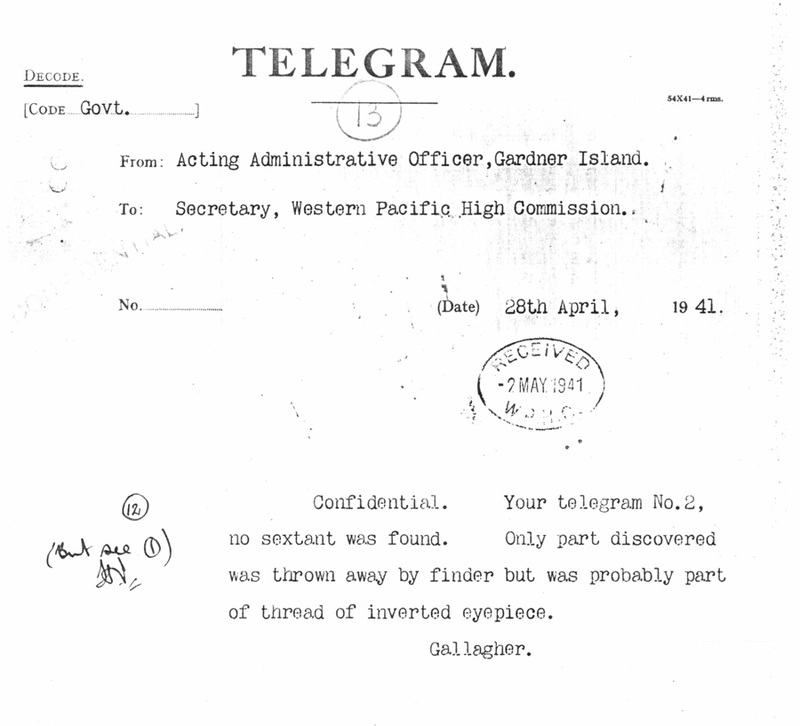 April 28, 1941: Telegram, Vaskess to Gallagher. DOC12, GBG15. Confidential. 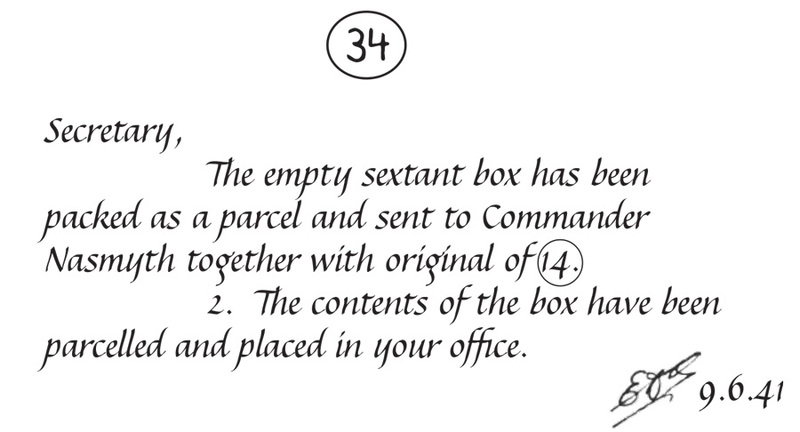 Your letter of 27th December remains and sextant box received but not the sextant. Did you forward sextant? 52. April 28, 1941. Note to file. MIN29. 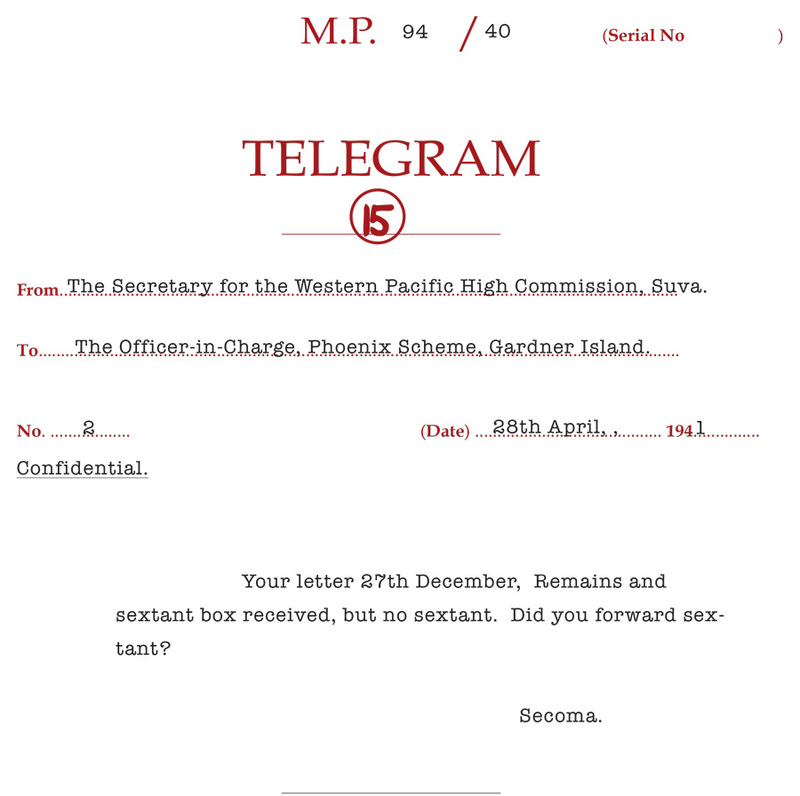 Telegram to Ag. A.O. Gardner Island No. 2, dated 28/4/41. coded & sent. 28/4/41. 53. April 28, 1941. 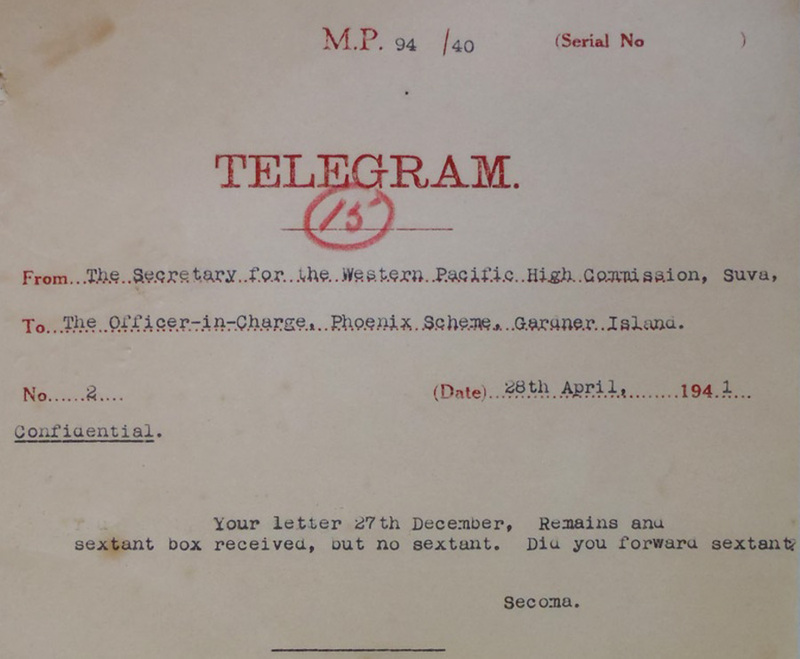 Telegram, Gallagher to Vaskess. GBG16, DOC13. Your telegram No 2. No sextant was found. Only part discovered was thrown away by finder but was probably part of an inverting eyepiece. 54. April 28, 1941: Note to file. MIN31. 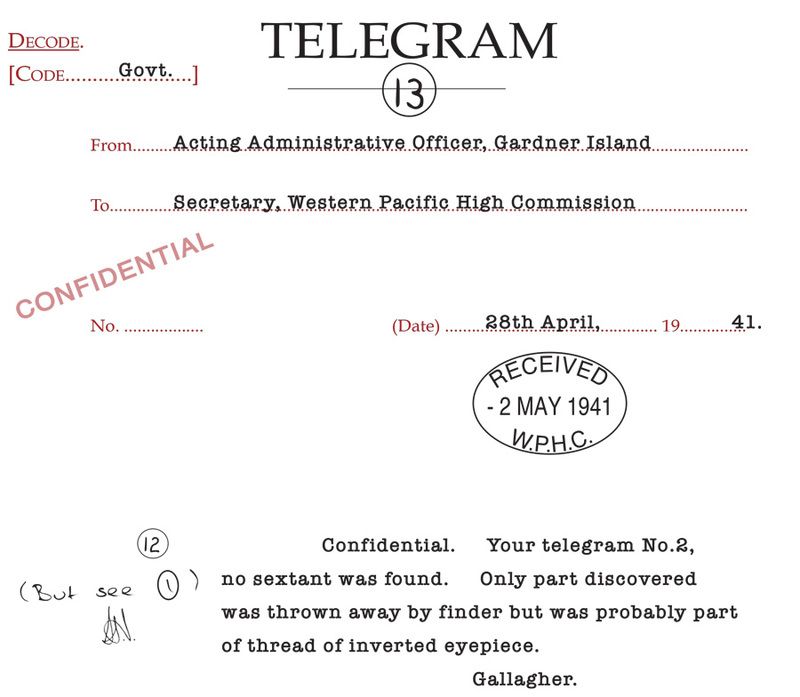 Telegram from O.C., P.I.S.S, Gardner Island dated 28/4/41. 2.5.41. 55. May 5, 1941: Note to file. MIN30. 56. 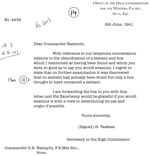 June 6, 1941: Letter, Vaskess to G.B. Nasmyth. DOC14. With reference to our telephone conversation relative to the identification of a sextant and box which I mentioned as having been found and which you were so good as to say you would examine, I regret to state that on further examination it was discovered that no sextant had actually been found but only a box thought to have contained a sextant. I am forwarding the box to you with this letter and His Excellency would be grateful if you would examine it with a view to determining its use and origin if possible. 57. June 6, 1941: Note to file re: #56. MIN32. D/o. letter to Cdr. G.B. Nasmyth, Suva, No. 4439 of 6.6.41, faired for signature. 58. 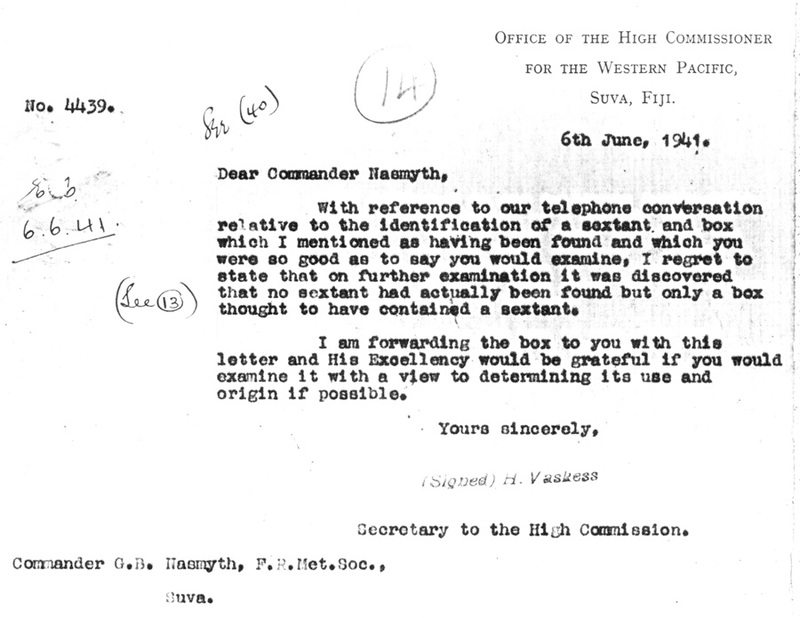 June 6, 1941: Note to file re: #56. MIN33. Please empty sextant box carefully and wrap box up in a parcel and send it to Cdr. 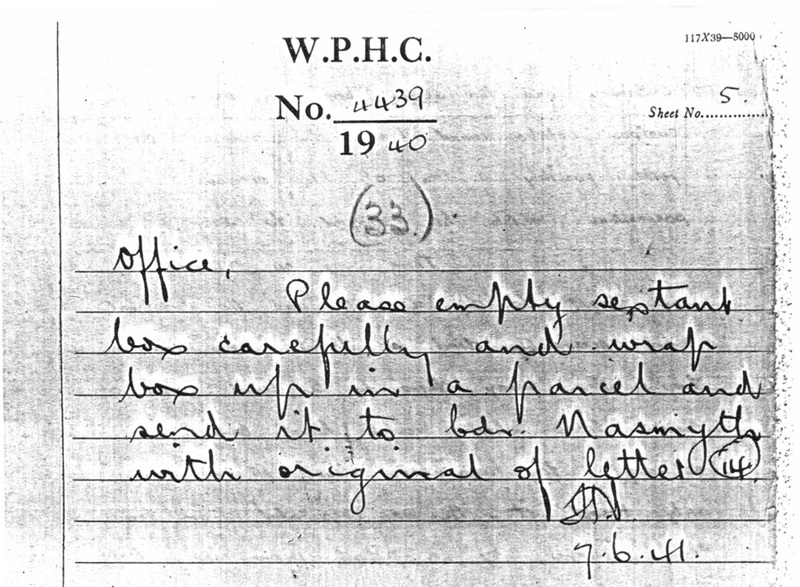 Nasmyth with original of letter 14. 59. June 9, 1941. Note to file re: #56. MIN34. 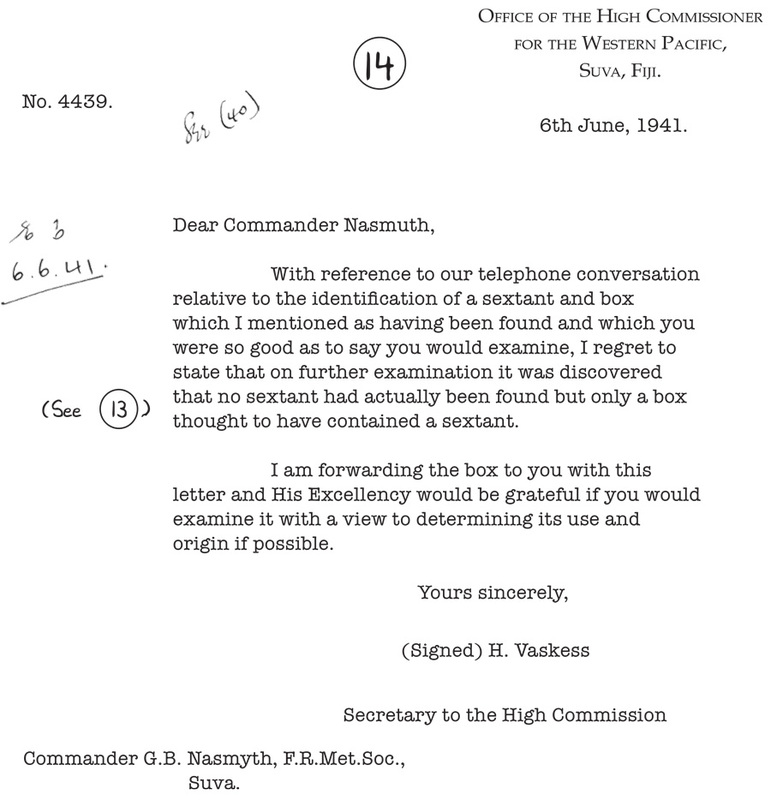 The empty sextant box has been packed as a parcel and sent to Commander Nasmyth together with original of 14. 2. The contents of the box have been parcelled and placed in your office. 60. July 1, 1941: Steenson to Vaskess. MIN35. 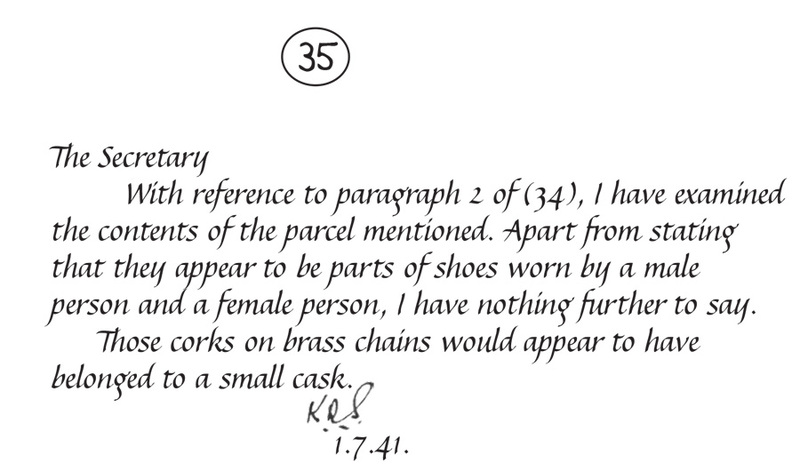 With reference to paragraph 2 of (34), I have examined the contents of the parcel mentioned. Apart from stating that they appear to be parts of shoes worn by a male person and a female person, I have nothing further to say. 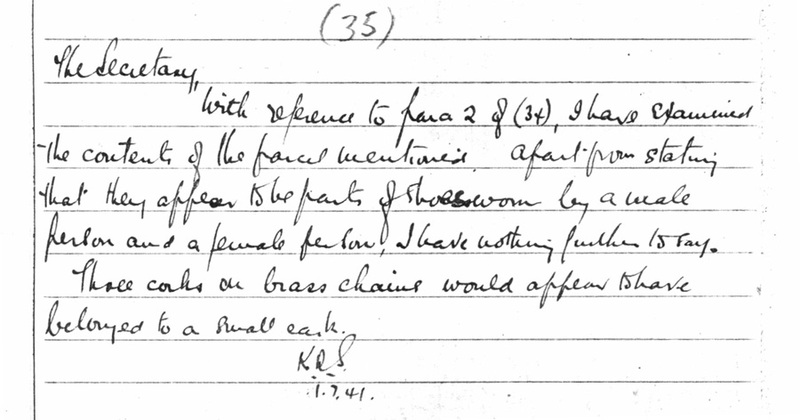 Those corks on brass chains would appear to have belonged to a small cask.